So far I’ve been working on tolerating mushrooms (with varying degrees of success), but today I admitted out loud that they actually tasted good. I still didn’t appreciate their texture, but the taste really was good. I have maybe broken out of my shutting-the-door-in-the-face-of-the–confrontation-of-my-own-pre-conceived –notions-of-how-mushrooms-taste tendency because I’ve been told multiple times that mushrooms generally just take on the flavor of whatever they are cooked with, but haven’t been able to accept that as a reality. I mean, I still don’t think this is always the case, but today it certainly was. 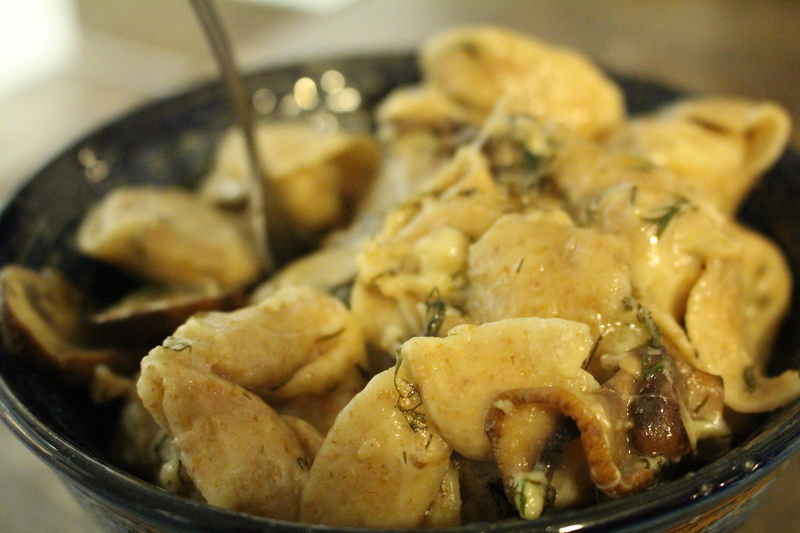 They were cooked up with fresh dill, lemon and parmesan in a tortellini pasta and that is exactly what they tasted like – a perfect dilly, lemon, cheesy blend of delicious. Too bad I’m still battling with the texture. Otherwise it would have been a perfect meal. Nevertheless! It is still progress so that’s just a tad bit awesome. ← Mind Over Mushroom Challenge, Day 18: Where’s The Beef?